Counterfeit Detection Volumes I & II: Reprints from The Numismatist contain significant articles on counterfeit detection that appeared in The Numismatist from 1977 through May, 1988. 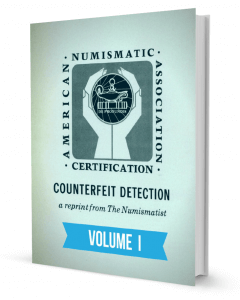 Not intended to be complete textbooks on numismatic counterfeit detection, rather, these volumes should serve as handy guides to those pieces, both counterfeit and genuine, that are of the greatest concern to collectors. It is our sincere hope that publication of this material will serve the hobby well in the suppression of these and all similar counterfeit and altered pieces. Detection and elimination of such items require constant attention and concern by everyone. 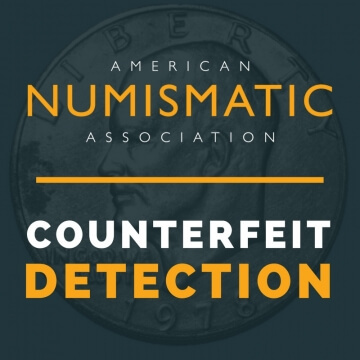 Readers having additional information about suspected counterfeit or altered coins are encouraged to contact the American Numismatic Association. **Please note: These volumes are large, and may take a few moments to open on your computer or mobile device.